The star of ‘The Other Two’ discusses his new and the future of LGBTQ+ representation in the industry. 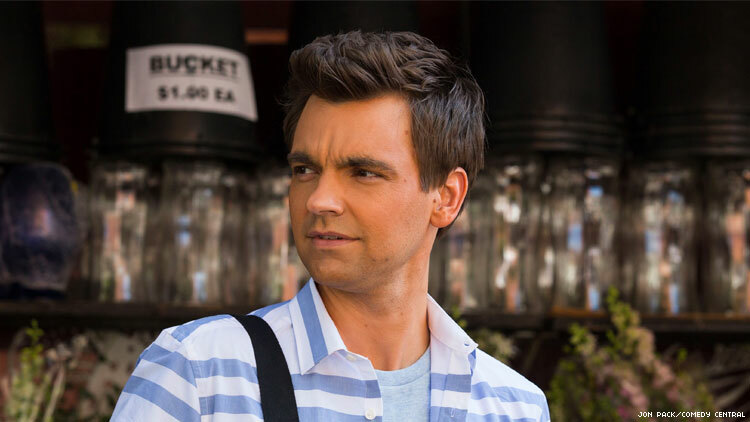 When Drew Tarver got the script for The Other Two, he thought it might be his first chance to have a more grounded acting role. Up to that point, because of his sketch comedy and improv background, many of his gigs involved a wig or a mustache, “just playing a dumb person who's a literal cartoon,” he said. But a read of The Other Two, which debuted on Comedy Central last month, promised a mix of the funny jokes, “but also sweet moments” he hadn’t had the chance to embody prior. He sent in an audition tape and a few in-person sessions later, he nabbed the part. From former SNL writer Chris Kelly and Sarah Schneider, The Other Two — which was recently picked up for a second season — follows aspiring actor Cary (Tarver), who is gay, and his sister Brooke (Heléne Yorke), a former professional dancer, who are trying to find their place in the world. Along the way, they must grapple with their feelings about their 13-year-old brother Chase (Case Walker) who suddenly becomes “the next big white kid” when a video of the teen singing goes viral. Comedy icon Molly Shannon plays their single mother opposite a cast that includes Wanda Sykes, Daniel K. Isaac, and Ken Marino. Ahead of the show’s third episode Thursday — in which, as shown in the clip below, Cary becomes an instant gay icon when his brother writes a song about him titled “My Brother Is Gay” — Out spoke with Tarver about being bisexual playing a gay character, what he loves about Desiree Akhavan’s The Bisexual, and his hopes for LGBTQ+ representation in Hollywood. What’s the thing you remember most about filming this show? One of the things I really like is that you're a bi guy playing the gay guy, and we typically don’t see openly bi actors at all, and it’s always straight people playing queer. How do you think your bisexuality impacted how you approached the character? When I read the script, I was like, "Oh, this feels like some real queer issues that I haven't seen.” It’s not as shied-away from. There's straight-up kissing. There's masturbation to men. I needed to see this on TV as a queer person growing up. This is very important and exciting for me to get a chance to do this. And I've dealt with, in my real life, internalized homophobia that I think Cary is going through and trying to figure out. Cary is a flawed character. He does things that he shouldn't necessarily do, but he's in a position where maybe that's the best he can do right then. Maybe he can only make out with his straight roommate because he has some sexuality issues that it's scary for him to really sit across the table from another man who is available and actually date them. So, I think that's all really cool stuff to see on Comedy Central. And I was very excited to be able to play that out as an actor. The situation with Cary loving, or at least being infatuated with, his straight roommate is relatable content. But from your vantage point, what is something that you think queer people, specifically, might be able to take away from this? I think it is just a queer character making mistakes, a queer character that is falling on his face because of issues that he hasn't quite dealt with. It's hard to figure yourself out as a queer person when you don't get to see yourself onscreen growing up and there isn't a real clear roadmap a lot of times with how things are supposed to happen. Especially in this business, too, being a bisexual actor and [the character] Cary is a gay actor in the show, so for me, there a lot of issues [he’s dealing with] that I've dealt with. With the straight roommate, and I don't want to spoil anything, but it's a very interesting thing where it’s, is Cary going to continue this sort of relationship that's not good for him in the pilot, is he going to stand up for himself, or is he going to date someone who's actually available? That's all stuff that's kind of heavy, and Chris and Sarah do a great job of touching on it for a second, doing something a little sad moment that's real and then back to funny stuff so it doesn't get too heavy. I think a point that you just made is a really salient one, that so many of these queer characters we see on TV are either very stereotypical or they have to be unassailable. Exactly. It's so exciting to see in this show a queer character be messy, and show how you learn to love yourself. I think Cary is learning that through this whole season. Now, the logline of the show is slightly foolish and doesn’t, I think, do justice to the depth of the show. When you first hear the premise, you think, "Oh, two jealous older siblings. They're going to be mean to the little brother. They're going to try to get his fame, or it's going to be broad [comedy]." But Chris and Sarah do such a great job of having it be a real family dynamic. It’s just so grounded and it keeps you there with the dynamic between the characters that is deeper than just that surface… I think the whole season does a really great job of subverting what you think the premise might be about on just hearing or seeing the poster. As an actor who happens to be bisexual, what are your hopes for opportunities in terms of representation in the industry? I'm really excited. The industry seems to be moving in a great way right now. I'm always excited for any representation that is diverse on TV. And as far as bisexual, I just watched this show on Hulu called The Bisexual... It's so good. You should watch it. I wish it would have come out a few years ago and I could have seen it, because I really needed to hear some of the stuff she says in that show… about bisexuality and about preconceived notions and bi erasure or biphobia. I just think that's so important, to give young, queer, diverse people representation they can see. Somebody once said, “If you can see it, you can be it.” I hope more keeps coming, because it's just very helpful for anybody that is part of any marginalized group.